Motorcycle Chains & Cable Locks |LD Motorcycles – Tagged "Mammoth"
A good Motorcycle chain or cable is a must have accessory for any rider, as there is nothing else that provides the level of security that a chain or cable does along with the same level of versatility, simply find somewhere solid and immovable to chain your bike to and its no longer able to be wheeled away. Take a look through our range of chains and cable locks to find what your looking for! 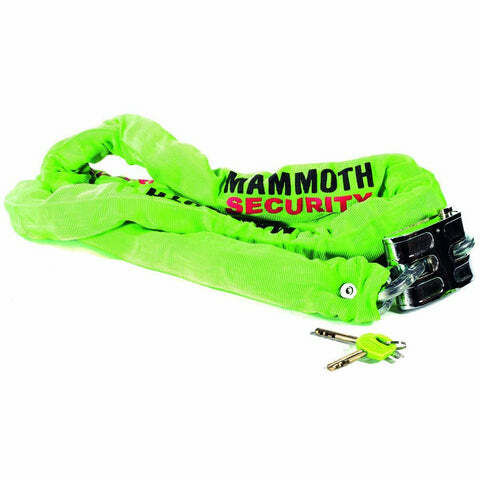 The 'X-Line' from Mammoth was designed to act as an extender or loop to be used in conjunction with other motorcycle security products, for example to secure your bike to an anchor use the shackle disc lock; therefore, preventing your bike being wheeled or lifted away. Outer sleeve coating acts as visual theft detterent and prevents your chain from scratching wheel rims of body panels when locking the bike or transporting the lock. 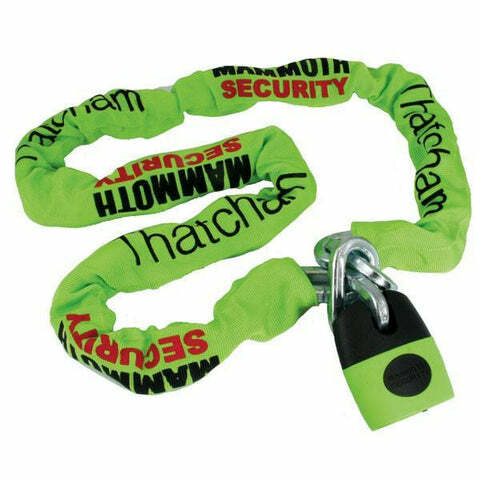 This 1.8 metre long Square Link hardened steel chain and lock kit features an 10mm hardened steel closed edge U-Shackle, with a pick and drill resistant locking barrel for optimum theft detterency and prevention. 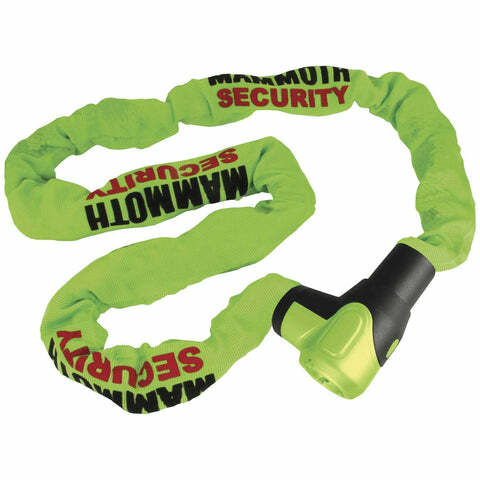 Bright green textile fabric chain sleeve acts as visual theft detterent and prevents your chain from scratching wheel rims of body panels when locking the bike or transporting the lock. Especially suited to securing your motorcycle to a permanent solid anchor point, lamp post etc. The ultimate theft protection for your motorcycle! 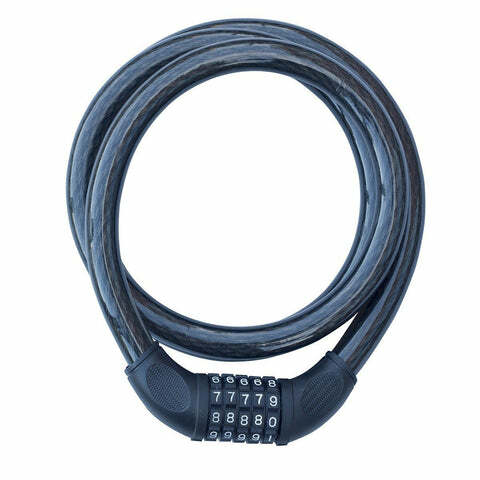 This large heavyweight chain and lock set has been continuously recognised and verified by UK security test house for exceeding levels required by insurers for bike security. Especially suited to securing your motorcycle to a permanent solid anchor point, lamp post etc. This super strong 10mm square link Cr-Mo chain combined with the uniquely shaped hardened steel block lock, provides great theft deterrancy and prevention. Also, thanks to the pick and drill resistant lock barrel the block lock is near impossible to be tampered with. 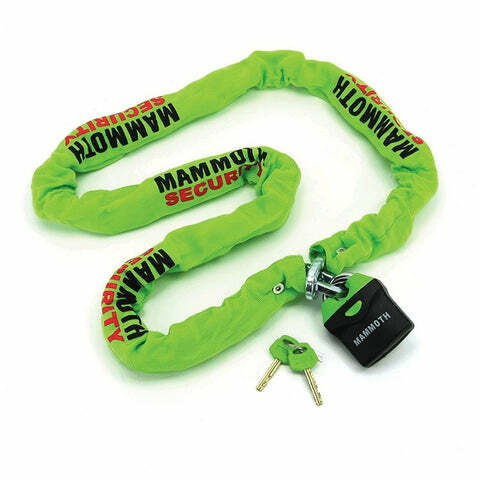 Bright green textile fabric chain sleeve acts as visual theft detterent and prevents your chain from scratching wheel rims of body panels when locking the bike or transporting the lock. Featuring a 10mm Square link hardened steel chain and integral re-inforced lockhead, this chain set is a simple but effective locking system for your motorcycle. 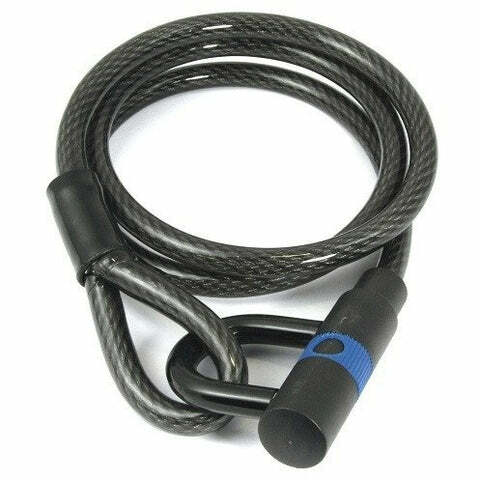 Cable locks can be used in the same way as chains but with more flexibility, less weight and therefore easier transport and storage, especially suited to securing your motorcycle to a solid anchor point or lamp post etc. The integrated lock head on cable locks means there is no need to carry a separate shackle lock as you would with a chain system. Outer sleeve coating acts as visual theft detterent and prevents your chain from scratching wheel rims of body panels when locking the bike or transporting the lock. 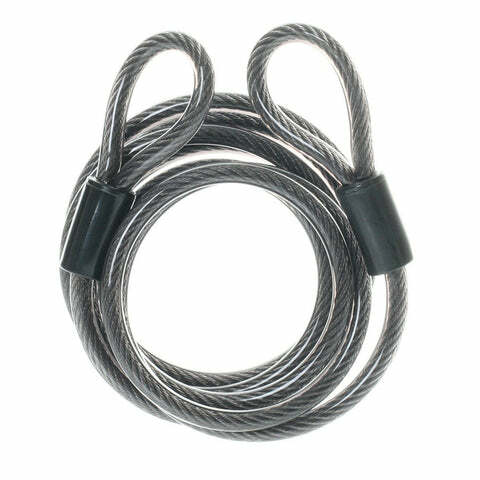 Looped end allows you to use cable in a 'noose' application for versatile locking methods. 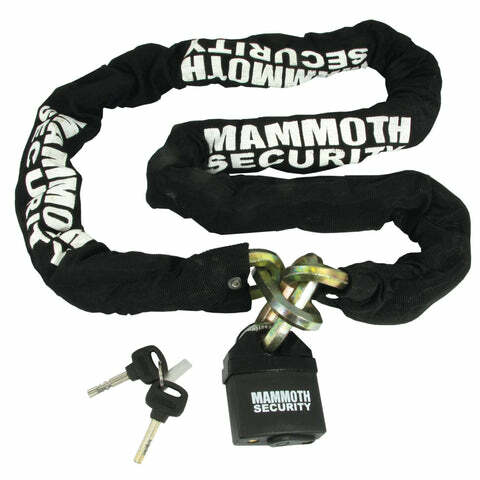 This 1.8 metre long Square Link hardened steel chain and lock kit features an 11mm hardened steel closed edge U-Shackle, with a pick and drill resistant locking barrel for optimum theft detterency and prevention. 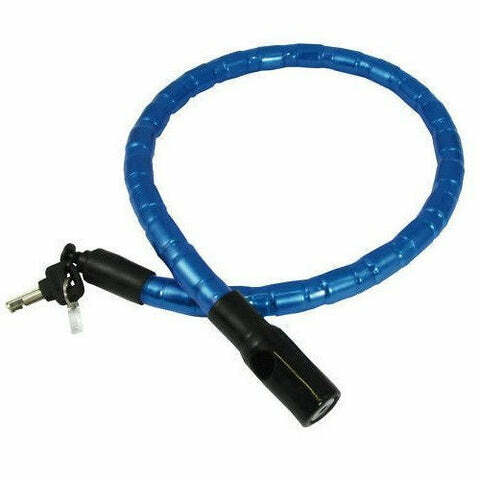 Bright breen textile fabric chain sleeve acts as visual theft detterent and prevents your chain from scratching wheel rims of body panels when locking the bike or transporting the lock. Especially suited to securing your motorcycle to a permanent solid anchor point, lamp post etc.